Facilities: USP Canaan with an adjacent minimum security satellite prison camp. 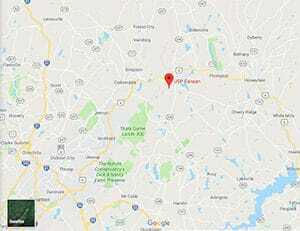 Location: USP Canaan is located in northeast Pennsylvania, 20 miles east of Scranton and 134 miles north of Philadelphia. Background: USP Canaan opened in 2005. Four murders have taken place at USP Canaan since its opening. In June 2011, one of the largest institutional outbreaks of salmonella poisoning occurred when 300 inmates and several staff members became ill after eating chicken in the prison dining room. Notable inmates include John Rigas and Timothy Rigas (father and son executives convicted in 2004 of bank fraud), Juan Matta-Ballesteros (drug kingpin serving a life sentence), Mohammad Shibin (Somali pirate leader serving a life sentence), and Luke Sommer (former Army ranger serving a 44-year sentence for bank robbery and soliciting murder). Housing: Inmates are housed in six housing units consisting of one and two-person cells. Inmates at the camp are housed in dormitories. Health Services: Health services include preventative care, diagnosis or treatment for chronic conditions, emergency services, mental health care, substance abuse treatment, annual immunizations/screenings, physical examinations, and dental care. Inmates must submit a triage form in order to be evaluated for routine healthcare needs. Emergency care is available 24 hours a day. Psychology Services: Priority psychology services include intake screenings, treatment of major mental disorders, crisis intervention, and suicide prevention. Other self-help, support, and lifestyle change programs are offered as resources and need dictate. Typical groups including anger management are offered. Residential Drug Abuse Program (RDAP): USP Canaan houses a Residential Drug Abuse Program (RDAP). It also offers a Drug Education class, the Non-Residential Drug Abuse Program (NR-DAP), Alcoholics Anonymous (AA), and Narcotics Anonymous (NA). Also offered is The Challenge Program assisting inmates in successfully reintegrating into the community through the elimination of drug abuse and elimination/management of mental illness. Education Services: USP Canaan provides literacy, GED, and English-as-a-Second Language (ESL) programs. Adult Continuing Education (ACE) classes and a parenting program are also available. High school diplomas and post-secondary programs are available through paid correspondence programs. Advanced Occupational Education: USP Canaan offers advanced occupational education in Culinary Arts. Vocational Training: USP Canaan and the camp offer vocational training in Horticulture. Apprenticeship: USP Canaan offers apprenticeships in Electrical, HVAC, and Plumbing. The camp offers an apprenticeship in Electrical. Library Services: USP Canaan’s Education Department provides a wide variety of reading material, including newspapers, magazines, and a broad selection of leisure reading books in westerns, fiction, nonfiction, biographies, references, science, history, and other areas. The TRULINCS Electronic Law Library is located in four stations throughout the institution, one in each pod, and one in SHU. Printers are located in the main law library, Commissary, and SHU. UNICOR: The USP Canaan UNICOR facility handles bindery operations. The camp does not house a UNICOR facility. Commissary: The Commissary provides a bank-type account for inmate money and for the procurement of items not issued regularly as part of the institution administration. Funds deposited by family, friends, or other sources are stored in the commissary account. Monies received for an inmate will be placed in the inmate’s Trust Fund Account. This money may be used for purchasing approved sale items in the institution commissary, sent home for family support, or other approved purposes. The commissary shopping schedule is based on each housing unit, and the shopping days are rotated monthly. Recreation Services: Leisure activities and recreation programs at USP Canaan are supervised by the Recreation Department. Programs include indoor and outdoor activities and range from individualized arts and crafts programs to intramural team sports, such as softball, basketball, and soccer. Physical fitness and weight reduction programs are also important activities for inmates and contribute to good mental health, healthy interpersonal relations, and stress reduction. Various leisure classes and hobbycraft programs are also available for interested participants.